Education policy can be complicated. So much of the work takes place at the state and local level, and with 50 states and D.C., that’s a ton of legislation to sift through. Enter the explainer deck: a chart-heavy, visually friendly approach to complex issues. Bellwether has several in our arsenal, covering topics ranging from teachers’ unions to state-specific education landscapes. Last week, we released the sequel to our comprehensive charter school deck. There’s a lot to dig into here, including student achievement, geographic trends, equity and inclusion, and public opinion, all tackled with simple data and analysis, and without taking sides. 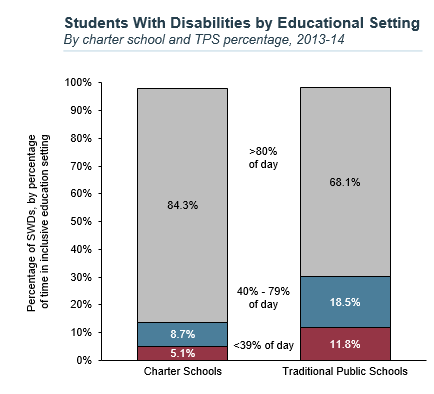 Charter schools serve relatively lower percentages of students with disabilities than traditional public schools. 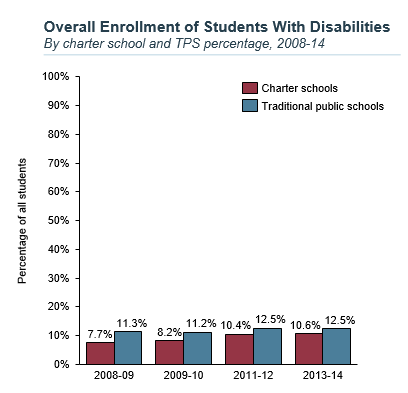 Enrollment of students with disabilities has increased across the board, but charter schools lag slightly behind traditional public schools (TPS) in their enrollment percentages. Over time, charters are gradually serving higher rates of students with disabilities. Charter schools report serving those students in more inclusive settings. Nearly 85 percent of charter school students with disabilities are taught in a general education classroom more than 80 percent of the day, compared to just under 70 percent of their traditional public school peers. Students with disabilities are more likely to face disciplinary action than peers without disabilities in both charter schools and traditional public schools. Both charter schools and TPS suspend and expel students with disabilities at approximately twice the rate of students without disabilities. However, disciplinary actions for students with disabilities in charter schools and traditional public schools differ across suspensions and expulsions. Charters suspend students with disabilities at a higher rate, and expel them at a lower rate, than traditional public schools. What does all this mean? The data can only tell us so much. When charters enroll lower percentages of students with disabilities, does that imply that charters screen or “counsel out” these students during enrollment, or that charters offer special education services that are more or less effective than those of traditional public schools? There are more unanswered questions, but in general, both sectors could be doing more to create an inclusive environment for students who need it most. Our new deck aims to lay the groundwork for productive debates and conversations. We don’t take sides on these questions, but we hope these graphics can be a starting point for actionable measures that foster real improvement for kids. This entry was posted in Charter Schools, Research and tagged charter schools, students with disabilities on January 31, 2019 by Kirsten Schmitz.